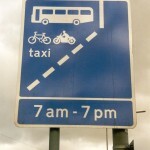 Riders in Northern Ireland have been able to legally use designated bus lanes since 2004. This sensible and progressive policy stands in stark contrast to the short sighted approach displayed by the authorities on this side of the border who refuse to see the benefits not just to motorcyclists as vulnerable road users, but also to society as a whole. Indeed, MAG Ireland’s recent submission to the National Transport Authority included a detailed and thorough assessment of the benefits and that submission was wilfully ignored by the NTA. In our recent meeting with the RSA’s Noel Brett, the MAG Ireland delegation again raised the use of bus lanes by motorcycles and the RSA has agreed to look again at this issue, albeit with some degree of reluctance. The RSA’s formal position is that there is no difference in overall road user safety to be gained by allowing bikes to use bus lanes, therefore we’re excluded. Our position is that since the RSA thinks there’d be no difference, we should be in there! MAG Ireland continues to push for the use of bus lanes by motorcycles, and the example set by the authorities in the North would be a good one for their counterparts in the South to take heed of.